We have been in the Faroe Islands for a little bit over two months now. A house in a little village of 1200 people called Vestmanna has been our home. 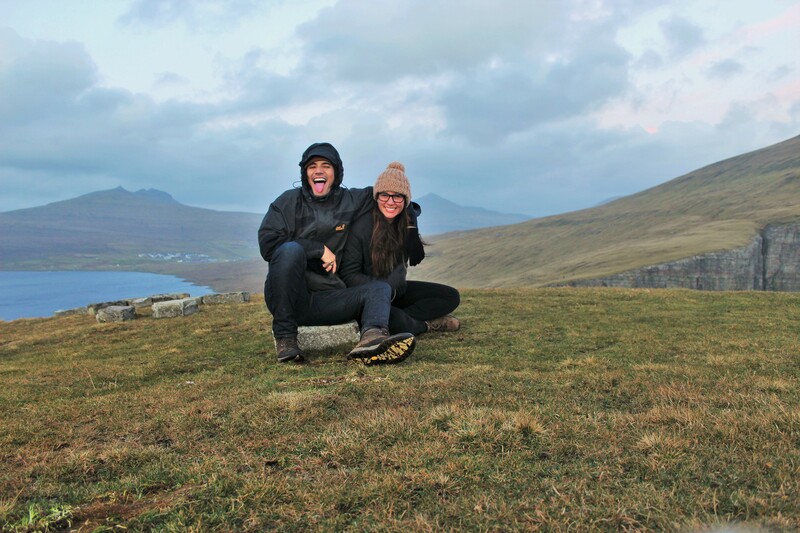 My mum was asking me about the food here etc so thought I’d do a blog post on Faroese life. The first, most obvious, thing here is the natural beauty of the landscape. Going for a short walk or drive you will pass many waterfalls that end up being ‘just another waterfall’ but it’s crazy to see so many beautiful ones. As well as the tree-less mountains!! The wind is just too strong for trees to grow. I’d also think another reason would be because of the lack of sunlight too. The next thing has to be the sheep. There are 70 000 sheep that call these islands home compared to 50 000 people. You do have to be careful whilst driving to avoid hitting sheep! Sometimes they just walk along in the middle of the road. Other times it’ll be pitch black, with the wind blowing a gale and they’ll be sitting on the side of the road chomping on some grass. Lack of sunlight is another major thing. There have only been a handful of days the whole time we’ve been here where we have actually seen the sun. It’s crazy! And I really miss it. It makes me realise how much I really love a warm climate and sunny days. Since it is winter here at the moment, the sun rises at about 9:30am, although it’s not a bright day, especially with the snow and clouds. It’s more like it’s just lighter than night time. The sun sets around 3pm now. We have problems sleeping due to the lack of vitamin D we get so we generally sleep in a bit. So we wake up and then before you know it, the sun is setting!!! I noticed at the beginning of being here, I’d start to get hungry when the sun would go down. So now I check my watch and see that, nope, another few hours before dinner time! Let’s talk about food! Breakfast is usually some toast from a brown loaf of bread (kind of like the types of bread they commonly have in Germany or Denmark) usually topped with cheese. I’m not too sure what a typical lunch is but dinner is definitely meat and potatoes! And gravy, of course. The type of meat can be half rotten fish, half rotten sheep or there is farmer here who has cows for beef. Chicken, pork and other beef products are imported and available in the supermarket. The half-rotten meat products are basically where the animal is hung up and stored in a cold, dry place for a period of time (most Faroese homes have a storage section for this purpose). The meat is then usually boiled or put in the oven with the potatoes. The smell is unlike anything I have ever smelt before. The smell of the food cooking is definitely worse than the actual taste of the meat. However since our taste buds have never tasted this type of food before they definitely got an overwhelming taste and it was not pleasant haha. Apparently this type of preserving meat is only done here because the air is so dry. Pilot whale meat is another type of meat commonly eaten. Most people that we know, at least, might have heard of the Faroe Islands from Sea shepherd regarding whaling. Whales have been hunted and eaten here for many, many years but while it continues to go on, more people are becoming aware of the mercury in the meat which does deter some people from eating it. Sea Shepherd have created quite a stir here in the Faroe Islands and the majority of people here hate them! A French guy visited here before us and had a long beard and long hair (hippy-ish looking) and got stopped by a policeman asking if he was from Sea Shepherd. Kel gets many looks from people due to his hair and I’m sure many wonder if we are from Sea Shepherd. After speaking to locals of what they think of whaling and what they think of sea shepherd, we learned that like most countries, they don’t want to rely on importing food and whales are one type of animal that are around for them and they see it as a sustainable food source. They kind of see it as their right to hunt whales. They also really don’t like being told by an organisation what they can or can’t do with animals in their environment. We’ve spoken to the boys that live here and they said if Sea Shepherd hadn’t come to the Faroe Islands and made such a fuss in the media, there wouldn’t have been as many hunts this year. What usually happens is that someone sights a pod of whales and calls the head whaler of the village. Then that person calls someone who calls someone else until the whole village knows. Apparently it has to be a quick process since the whales can move on. Everyone who wants to hunt, stops working (even teachers! Children are sent home!). We’ve heard that these days hunting whales is a lot better than before as they are focussed on killing the whale in the quickest and pain-free way. The images you can see on the internet of the whale hunts are so graphic due to the water turning red and it’s so shocking since that type of scene is so foreign to us. It’s been very interesting learning about this issue. All this info has been from some Faroese locals. The weather here is pretty much like England. Eg lots of rain, not too much sun and that’s what we were prepared for. Unlike typical English weather is the amount of heavy wind here!!!! I’ve never felt the wind be so strong before coming here. One time I crossed the road to get to the neighbour’s house and I was huffing and puffing just because I was trying so hard to stay upright walking while this gale was pushing me!!! The scariest thing is driving in it. Since I can only drive automatic cars, Kel always drives but I am soooo happy for that. Being in the car when it’s windy, you can hear the wind but also feel the wind AND, if it’s raining, see the rain going horizontal instead of vertical and it really does move the car. When Kel is saying ‘geeees! !’ that really freaks me out since that means he is scared too!! It is possible cars can be blown over!! Many people place rocks in their cars to weght it down! We were driving to a tourist spot the other day called Gjogv which there are two ways to get there. The first route we took we ended up having to turn around because the wind was THAT strong. It was like being in a hurricane or something, it was incredible to feel how strong it was. We found out later from a local that the road to Gjogv we were taking was advised not to take the route on the radio. The houses here must be built in a special way because there are hardly any house problems due to wind considering the other night wind speed got up to 170 km per hour!!! Wind isn’t the only thing you have to worry about while driving here. Other drivers are the main issue! Both of us rate Faroese drivers as the worst drivers we have come across. Ok maybe on par with the bus drivers in Nepal and India. But to say that they come close in terms of dangerous driving says something!!! You’d think that heavy downpours of rain and strong gusts of wind would make drivers slow down and perhaps not overtake on corners/blind spots…. NOPE!!! Not here! Here there are only one lane roads for each direction of traffic so a lot of overtaking takes place especially as there are trucks on the road. There have been many times where there are cars oncoming towards us because they are overtaking traffic in the other lane so we have to quickly brake. Many times! Even the other night (since it’s pitch black at like 4pm so it feels weird to say afternoon) we came out of a tunnel and turned a corner and a SLOW truck was trying to overtake cars at the last minute and we had to slam on our brakes while it’s raining strongly. Crazy! The other thing is that many leave their headlights on while driving even if other cars are coming their direction. The Faroese language is veryyyy difficult to learn! The sounds of the letters are so so different to English and it’s even hard just to pronounce the letters let alone words. Natascha, who I mentioned in a previous blog, came to the Faroes 15 years ago and learnt the language and I really admire her for that! It really must’ve been hard! One word I do know, yet I know I don’t pronounce properly is bíða pronounced kind of like boo ya. I kept hearing boo ya boo ya especially when someone was talking to the dog haha it’s my favourite word. It simply means wait. We had planned to stay in the Faroes for three months but feel it’s time to move on. It’s been a massive learning experience with the culture which has been difficult at times as well as living with this type of weather and feeling the cold which we hadn’t really felt since last years winter – if you can properly call that a winter! I feel very grateful to have met the people that we have (truly amazing) and there are a few who we will definitely keep in contact with! We were meant to get the ferry yesterday to Iceland but because of a storm in Denmark it’s been delayed for a few days. Not looking forward to the swaying of the boat but at least it’s only for one night and not in a couchette this time! Current weather in the village where we will be staying in Iceland is -2 degrees and snowing. Tonight a storm is meant to be hitting Iceland which is said to be one of the worst storms in 24 years so that’ll be interesting!!! Onto Iceland… woohoo!! !